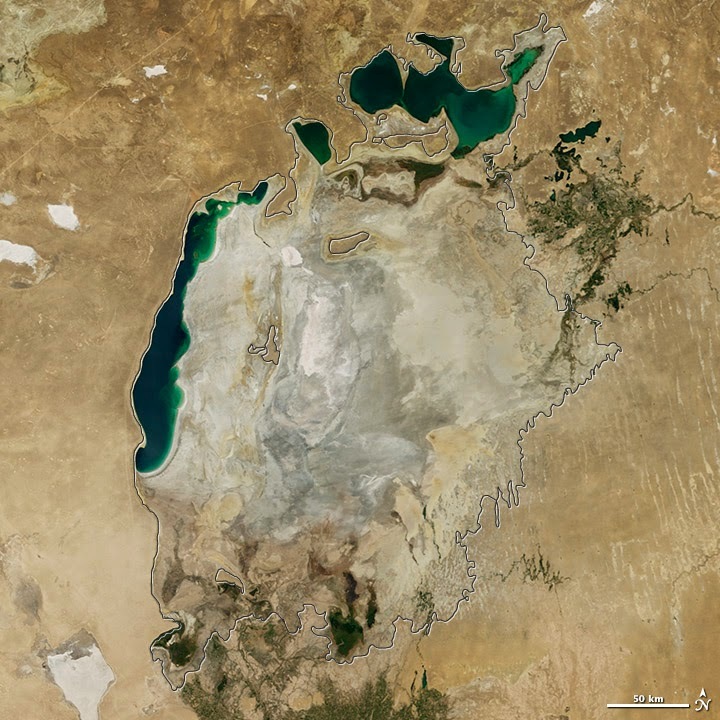 The latest NASA satellite imagery of the Aral Sea – once the world’s 4th largest lake, shows with alarming clarity the devastation that reckless human exploitation of the earth’s resources has caused. In the 1960’s the lake was a major freshwater body, and supported a thriving natural ecosystem and human populations. As with most communist era infrastructure projects, the massive dam building that occurred from the 60’s onwards had scant regard for environmental cost. With reduced water inputs, over-exploited fisheries, biodiversity loss due to increasing salinity and nutrient pollution – this was really a perfect storm of environmental genocide. The change in hydrology was so massive it even affected local climate – with colder winters and hotter drier summers arising. The really sad thing is that this is neither the first or an isolated occurrence, in many countries from the former USSR to China and the USA the environment is sending out these very clear signals that we are at the very limit of carrying capacity for human occupation on Earth. Should it be normal that California is sucking its rivers dry to supply over-populated cities? Should Chinese people live with drinking water that is toxic?, should caviar need to be screened for radionuclides in Russia? – politicians are not going to help unless there are votes in it, and history will judge many of them for what they are – a feckless drain on human sustainability – it’s time science made a bigger impact on policy (Think for example on how many times you read of proposed fishery quotas based upon scientific surveys aimed at sustainability being changed by politicians for profit-based reasons) – scientists need to be more involved, be better communicators and perform rigorous irrefutable science. The human cost of the Aral Sea tragedy should also not be underestimated. Aside from dreadful socio-economic impacts on communities downstream of the dams, there is now a very real threat from dust – yes I know I am always going on about dust but it really is a bid deal on our planet. A direct causality between contaminated dust from dried lake sediment and human health is now apparent, and this echoes what I have been saying for a while about desert dust – it is a significant factor in inter-continental dispersal of pollutants and microbes, and should be more widely acknowledged as a connective link between biomes, and ecosystem and human health. There is a (very) small light at the end of the tunnel – In 2005 the Kazakhstan government attempted to save the northern part of the lake by building a dam bisecting the lake (sadly the southern part of the lake was deemed to be beyond salvation) and there is some evidence that the northern lake is improving slightly. However, the Aral Sea will never again be what it was, and our planet is all the poorer for this.